Friday, June 19 – 2nd Annual Fundraiser for Students’ Trip to El Salvador! 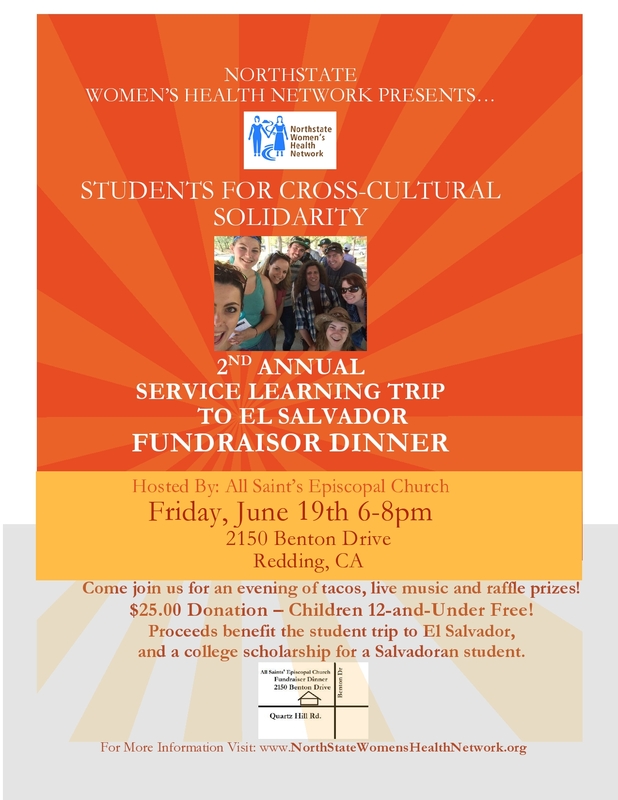 Join Northstate Women’s Health Network in our second annual fundraiser for students’ service learning trip to El Salvador on Friday, June 19th, 2015 from 6pm-8pm, held at the All Saints’ Episcopal Church, 2150 Benton Drive in Redding. We’ll be celebrating last year’s accomplishments and sharing about this year’s projects, with tacos, live music and raffle prizes! $25 Donation – Children 12-and-under free! Proceeds benefit the student trip to El Salvador and a college scholarship for a Salvadoran student. Contact Linda McCrea at (530) 945-2158 to reserve space or with any questions – donations accepted at the door.